The Boys’ High School and College family bid adieu to the outgoing batch of ISC (12) students in a colourful farewell function organized in the Middle School Hall. To express their gratitude and love for the seniors, a number of performances were staged by the students of class XI. The atmosphere inside the hall turned nostalgic as the formally dressed young gentlemen entered the hall amidst clapping and cheering. The hall reverberated with excitement and anticipation as the captains of the four Houses, walked with pride and honour for one last time. College Captain, Laksh Kawatra led the four house captains to handover the flags to the Principal, Mr. D. A. Luke. At the outset, the outgoing students of ISC (12) batch were welcomed by Jeevesh Dubey and Parth of class XI. Thereafter, Mr. Joel Lawrence led the students in prayer. 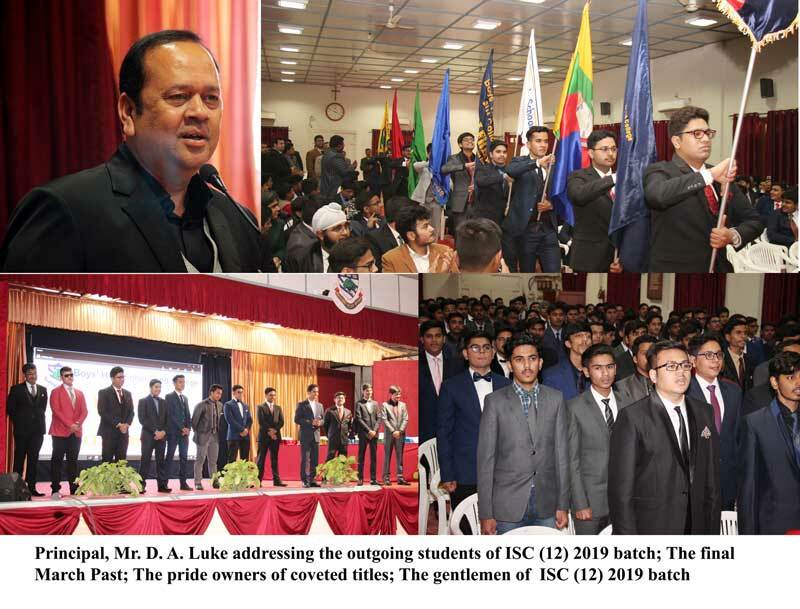 In an inspiring and meaningful address to the outgoing students of ISC (12) batch, the Principal, Mr. D. A. Luke asked them to remain focused and disciplined in their future endeavours as they are going to begin a new chapter in their life. Extending his good wishes to them for their upcoming board examinations, he said: “Our prayers and blessings are always with you and we intently pray that you excel in the field you have chosen.” He added that your upbringing in school will hold you in good stead to overcome the obstacles which come on your way to success. He asked the students to keep the flag of the school flying high. Thereafter, on behalf of class XI students, Sarvagya Chitranshi delivered an emotional speech and thanked the seniors for their love, cooperation and guidance. After this, the College Captain, Laksh Kawatra delivered the farewell address. He recounted his school days and thanked the teachers for shaping and moulding their personalities. He encouraged his juniors to follow their passion and promised to return back to his Alma Mater with glory and success. The fond memories of the School life were captured in the power point presentation. It threw light on the journey of students in the every sphere of their activity, be it academics, sports, extra-curricular and co-curricular activities. In honour of the outgoing students of ISC (12) batch, the class XI students presented a special song and a skit titled ‘Journey of a student—A nostalgic story’. The excitement in the hall reached its peak with the much awaited Band performance. Amidst cheers and thunderous applause, the Academic Supervisor, Mrs. C. B. Luke announced the titles for the selected outgoing students. These titles were awarded to the students who have left an indelible mark through their performance in academics, sports and extra-curricular activities. The coveted title of ‘Mr. BHS’ went to Laksh Kawatra while the First Runner Up was bagged by Akshat Rai. The Second Runner Up title was shared by Pratyush Mishra and Tanish Arora. The title ‘Neighbour’s Envy, Onwer’s Pride’ went to Mohd. Muzzammil (XII A), `Mr Perseverance’ to Vibhav Chandra Srivastava (XII A), `Mr. Versatile’ to Pratyush Mishra (XII B), `Mr. Wit’ to Akshat Rai (XII A), `Computer Wiz’ to Mohd. Muzzammil (XII A), `Prince of Dramatics’ to Harsh Gaur (XII D), `Unity and Discipline’ to Ved Prakash Srivastava (XII C), ‘Eloquence Personified’ to Pratyush Mishra (XII B), `Michael Jordan of BHS’ Abhijeet Pandey (XII D), ‘Smart Alec’ to Pranav Srivastava (XII A), `Boys’ High School Rockers’ to Manas Bhadauria (XII A) and Rakshit Robin (XII B), `Michael Phelps of BHS’ to Mazhar Hasan (XII C), `Happy Feet’ to Yash Pandey (XII A) and ‘The Pride of Boys’ High School’ to Laksh Kawatra (XII D).